This is a wonderful French classic that is a melt-in-your-mouth experience. I had it several times on our last trip to Paris, and couldn't get enough. It is best baked in individual ramkins, with different accompaniments. The following recipe makes enough for four cakes, and takes about fifteen minutes for preparation, and ten minutes baking time. 4. Stir in the melted chocolate and then whisk in the flour. These can be made ahead of time, but are best served freshly baked. You want to make certain that the center is liquid, with the top just crusted over. In Paris this was served largely with a crème anglaise. If like raspberries with your chocolate, you can add, or serve alone with a raspberry coulis. While we were in Strasbourg, France, we discovered this wonderful confectionery in Petite France. They had a zillion versions of gingerbread. Some were loaded down with candied fruit, or seeds, or preserved orange slices. All looked wonderful. Here is a recipe that you can add your own touches to. 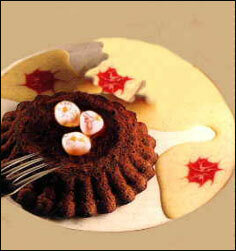 The taste is very much like a cookie that my mother makes, which she called Leb Kuchen. 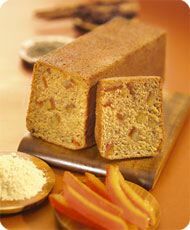 Indeed, when I gave a loaf of this to my cousin, Maria, in Germany, she used that name, Leb Kuchen, as well. 3. Mix the dry ingredients in a bowl and form a well in the center. 4. In a small bowl, whisk the eggs, honey, water, and 2 tablespoons of the rum together. 5. Pour the liquid ingredients in to the well, and stir into the dry ingredients until well combined. 6. Spread the batter, which will be thick, into the prepared loaf pan. 9. Cool bread on rack.